Scott Horton joins us from Texas to talk about the withdrawal of troops from Syria and Afghanistan. 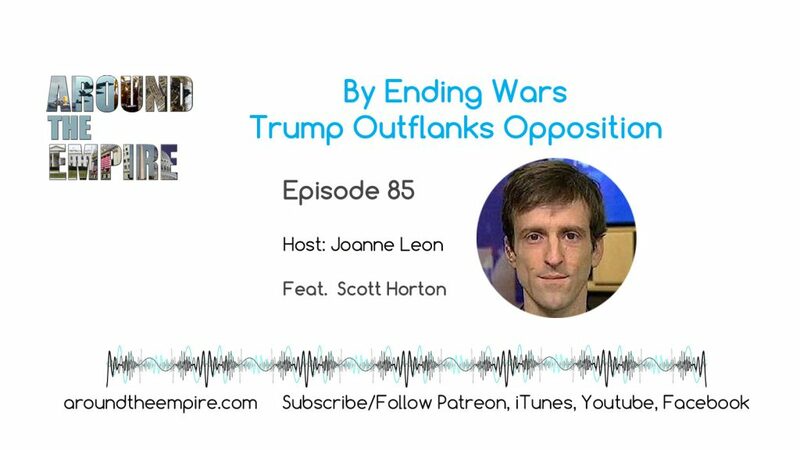 Scott and Joanne offer some cautiously optimistic analysis on Trump’s latest actions on war and foreign policy and how he could use a “Horton’s Rule” strategy to his advantage, outflanking Left and Right opponents with detente and de-escalation. Is there an “only Nixon could go to China” opportunity for Trump and will he deliver on it? We also discuss the dilemma that Establishment Democrats’ have created for themselves as they assume a twisted political opposition to scaling down wars and now routinely provide unquestioning fealty to the national security state. Lastly, we review William Atkin’s dissenting farewell memo to NBC and the media’s passive acceptance and cheerleading of perpetual war. Major Danny Sjursen joins the show to talk about about the war in Afghanistan, an unsustainable quagmire for which no more blood and treasure should be sacrificed. 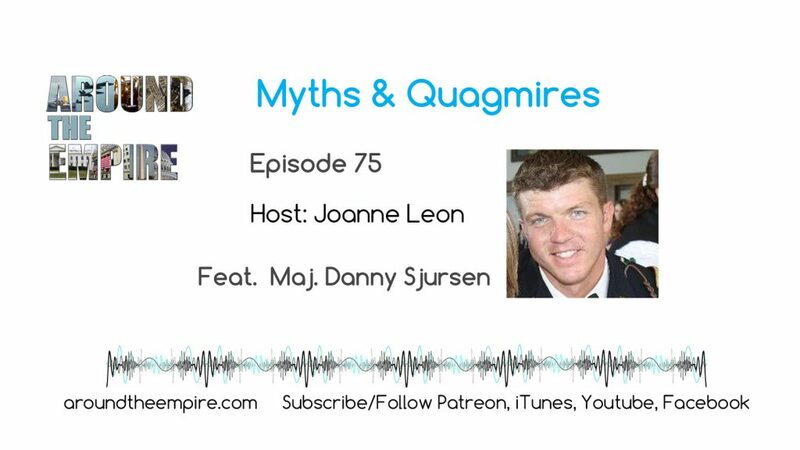 We also talk about the magical American soldier myth and the empire denial syndrome. 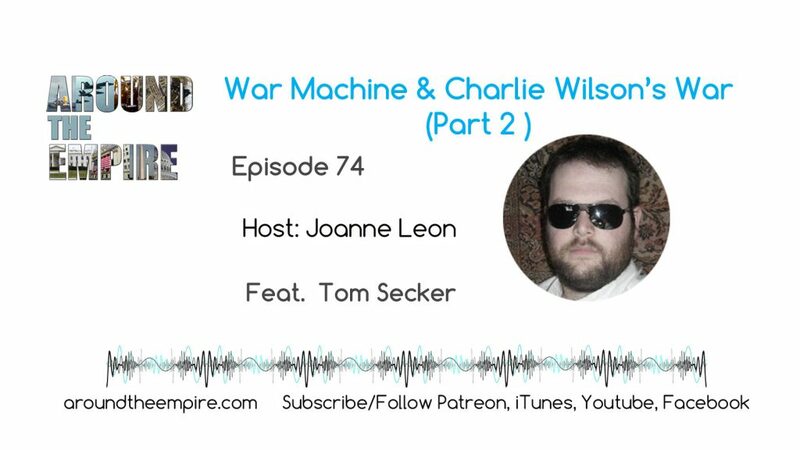 Tom Secker joins the show for this two-part series as we compare and contrast two movies: War Machine and Charlie Wilson’s War. We talk about Afghanistan, wars, history, geopolitics, movies, the involvement of the national security state in the entertainment industry and more. A great conversation that is interesting and informative, both serious and light-hearted at varying times and is packaged into two episodes (available in full in advance for patrons). Dan and Joanne talk with Scott Horton about his new book, Fool’s Errand: Time to End the War in Afghanistan. Scott is an author, managing editor at the Libertarian Institute, editor at antiwar.com, host of Antiwar Radio for Pacifica, and the Scott Horton Show podcast. Recorded on September 15, 2017. Music by Fluorescent Grey. By now, most Americans should be aware that the country is in the middle of a serious opioid addiction crisis. 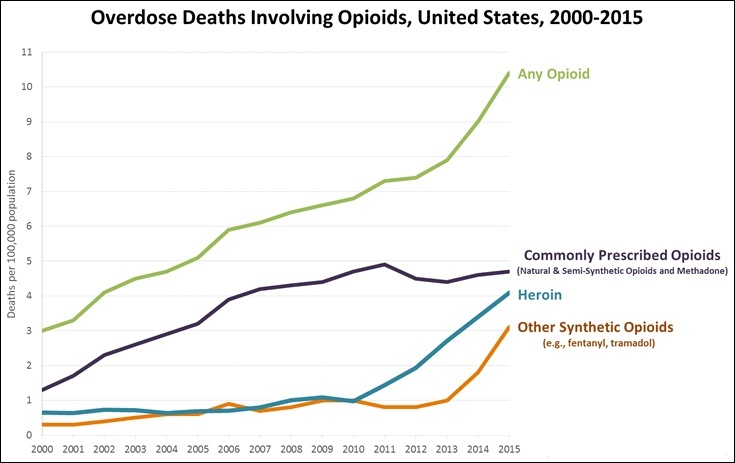 Drug overdose is now the leading cause of death for Americans under 50, two thirds of which are from opioid overdoses. While approximately half the opioid overdose deaths are from prescription drugs, heroin use has also dramatically increased. A study from Columbia University found that heroin use among American adults has increased almost fivefold in the last decade. The relationship between prescription drug abuse and heroin use is key to understanding the crisis. Often after getting addicted to a prescription opioid like OxyContin or Vicodin, a now-addict is cut off by a physician from legally obtaining an opioid drug. That person then moves to heroin, which is readily available on the black market and in high-quality form. And where is all this high-quality heroin coming from? Afghanistan. 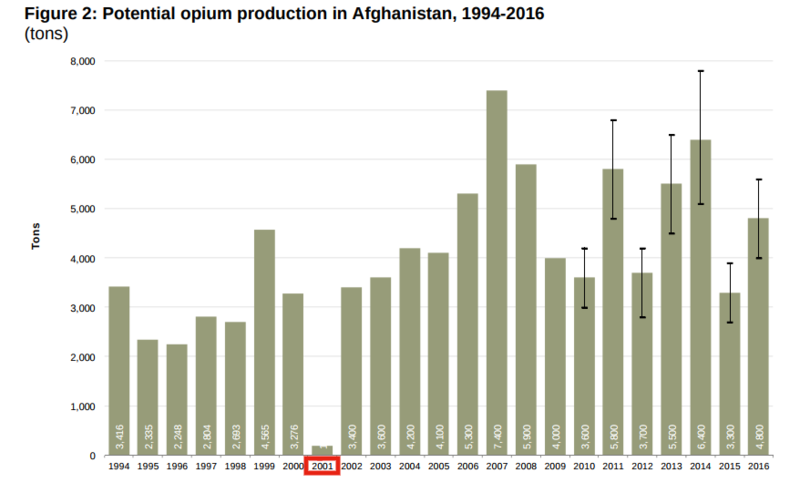 Since the U.S. invasion in 2001, opium production in Afghanistan has spiked – paralleling the spike in opioid use in the United States. According to the United Nations Office on Drug and Crime, opium production has massively increased since 2001, hitting higher levels in 2016 from 2015. Source: UNODC, opium surveys 1994-2016. This increased production has led to the U.S. (and other places) being flooded with cheap and very potent heroin. Given the scale of the opium production in Afghanistan, it would be absurd to claim the U.S. government is somehow unaware of the activity. In fact, all available evidence suggests U.S. forces are tolerating the thriving opium trade in exchange for loyalty from Afghan political leaders – a process that, at one time at least, went all the way up to the president. After the overthrow of the Taliban in 2001, the U.S. installed Hamid Karzai as president of Afghanistan. The president’s brother, Ahmed Wali Karzai, became one of the biggest opium dealers in Afghanistan to such a degree that U.S. officials felt the need to continually lobby President Karzai to get his brother under control or exile him. The White House says it believes that Ahmed Wali Karzai is involved in drug trafficking, and American officials have repeatedly warned President Karzai that his brother is a political liability, two senior Bush administration officials said in interviews last week. Numerous reports link Ahmed Wali Karzai to the drug trade, according to current and former officials from the White House, the State Department and the United States Embassy in Afghanistan, who would speak only on the condition of anonymity. In meetings with President Karzai, including a 2006 session with the United States ambassador, the Central Intelligence Agency’s station chief and their British counterparts, American officials have talked about the allegations in hopes that the president might move his brother out of the country, said several people who took part in or were briefed on the talks. Ahmed Wali Karzai was assassinated in 2011, but the president’s family were hardly the only ones in the Afghan ruling class getting a taste of the profits from one of the country’s biggest exports. A similar deal was made by the Reagan Administration in the 1980s with cocaine dealers in Central and South America. The CIA helped facilitate the importation of cocaine into Los Angeles by an anti-communist group known as the Contras (at the beginning of what would become the crack epidemic) in order to assist the Contras in their war against the socialist government of Nicaragua. But if the U.S. government really wants to curtail the opioid crisis, it has at least one clear and obvious action it can take – stop the war in Afghanistan.